The Cradle of Forestry along Scenic Forest Byway 276 in Pisgah Ranger District is the birthplace of forest conservation in America. Spanning over 100 years of forest conservation history, the Cradle offers a snapshot of life at America’s first School of Forestry along the Biltmore Campus Trail. German forester Dr. Carl A. Schenck accepted George Vanderbilt’s offer to come to North Carolina to transform the woodlands we know today as Pisgah National Forest. To insure the forest would remain enticing, Schenck established the forestry school to pass along his knowledge and skill to the next generation of forest guardians. 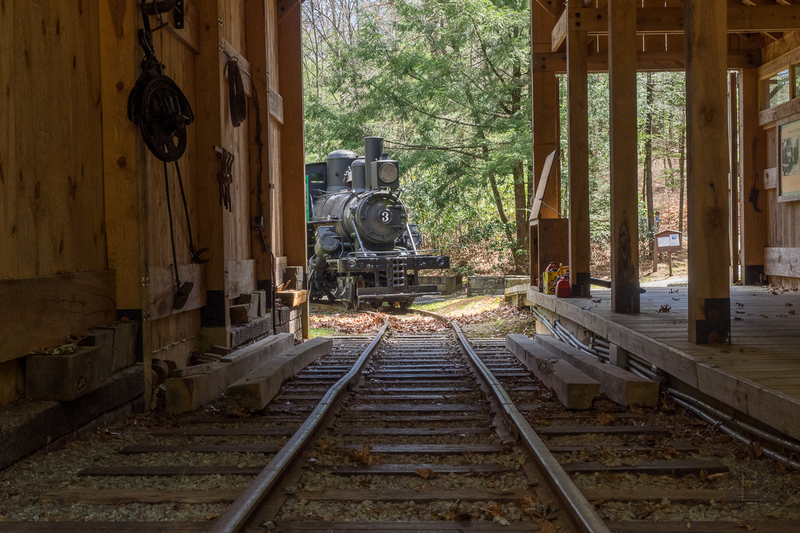 You can also take a picturesque walk along the Forest Festival Trail complete with a restored 1914 logging locomotive. This stunning 6,500 acre treasure is replete with century-old historic structures and reenactments, mountain streams and vistas, and satisfying fun for the entire family. I completely enjoyed my time there on Saturday, April 11, 2015 from 11:30AM to 1:20PM. My plan was to explore the campus at the Cradle of Forestry by walking all the trails. Hike Rating: Easy. Some moderate climbing on the Forest Discovery Trail. Trail Condition: Paved, wheelchair accessible walkways. Starting Point: Joint trailhead behind the Forest Discovery Center. Trail Traffic: I was there on a Saturday that was beautiful Spring weather, on opening day for the new season. There were perhaps 50 other visitors there while I was. On a mid-season weekday, expect very little trail traffic. How to Get There: From the Hwy 64, Hwy 280, Hwy 276 junction in Brevard, NC, take Hwy 276 into Pisgah National Forest. The facility is 11 miles up on the right. Watch for signs to the Forest Discovery Center/Cradle of Forestry. If you reach Pink Beds, you have gone too far. If coming from the Blue Ridge Parkway, exit the Parkway at milepost 412. Take Hwy 276 toward Brevard four miles. Turn left into the Forest Discovery Center. The Cradle of Forestry National Historic Site is located on Hwy. 276 near Brevard, NC, and is open every day April 11 – November 8, 2015 from 9:00 a.m. – 5:00 p.m. Admission is $5.00 for adults 16 years of age and older and FREE for children under 16. Admission if also FREE for everyone on Tuesdays, and any day for those with Federal Interagency or Golden Age Passports. They have a significant series of special events that are listed on their events calendar, and the Cradle is a popular destination for school field trips. There are two primary trails within the Cradle of Forestry. Both start the same place, behind the Forest Discovery Center. After you’ve had your fill of exhibits and historic films in the Center, you should tighten the laces on your shoes and step out into the forest. Take a right (east) to get on the Forest Festival Trail. All trails within the Cradle of Forestry are paved with asphalt, so special hiking footwear is not required, and they are wheelchair accessible. The first landmark you will encounter on the Forest Festival Trail is the amphitheater. Continue a ways further and you will reach a split in the trail at the woodland pond. It’s decision time. You can take the left fork and continue on the Forest Festival Trail, or you have an option that offers a little more exercise. The Forest Discovery Trail is 1.3 miles in length and climbs approximately 250 feet as it winds through the Pisgah forest. If you aren’t sure about your stamina, don’t worry, there are comfortable benches to rest on approximately every hundred yards. You eventually end up the same place, you just cover more distance to get there. Where the Forest Discovery Trail returns to meet the Forest Festival Trail you will find an historic locomotive. Originally in operation in 1914, this Climax steam engine was purchased in 1973 along with 400 feet of narrow guage rail, a log loader crane car, and four log cars. Forest Service employee Elbert Wilkie had learned the engine inside and out while working for a lumber company. He refused to retire from the USFS until it was totally restored and operating. The Climax #3 now serves as an educational reminder of life as loggers in the forest a century ago. As you continue along the Forest Festival Trail you will encounter the remains of an old mountain homestead. Cast among tall pines and oaks, those who originally lived here sure had a comfortable wooded spot to call home. The trail is lined with beautiful spring flowers like vinca vine and violets. Next stop, a couple of antique road graders. To get in and out of Pisgah National Forest, they had to build roads. Many of the forest service roads that traverse the hills and hollows here had their genesis during the heyday of the Cradle of Forestry. The final stop along the Forest Discovery Trail is a spring house that channels the cold, fresh mountain water. The forest and streams work in concert to create habitat for wildlife, including trout, songbirds, and your favorite four-legged creatures. OK, so you’re back at the Forest Discovery Center now. Perhaps you went inside for a rest room break or a refreshment. Now you’re ready to resume your exploration of the Cradle of Forestry. The Biltmore Campus Trail goes left (west) from the back of the FDC. First up is the restored original schoolhouse where the forestry students received their training. The Biltmore Forest School was founded by Dr. Carl Schenck in 1898. No structured forestry education existed in the United States at the time, so Dr. Schenck was passing along old world experience to new world apprentices. In 1908, Schenck hosted the Biltmore Forest Fair, designed to demonstrate the accomplishments and possibilities of scientific management and practical forestry techniques, and to celebrate the 10th anniversary of his Forestry School. The Forest Fair continues as an annual tradition to this day. If you’re interested in learning more about the origins of the Cradle of Forestry and the Biltmore School, I recommend Marci Spencer’s book Pisgah National Forest: A History. The Biltmore School of Forestry offered a one-year course of study, and the curriculum focused on providing traditional classroom lectures in silvicultural theory supplemented with extensive practical forest management field training. Schenck’s students spent most afternoons in the forest doing hands-on work and directly applying the theories they had learned in the classroom. Schenck was a demanding, but engaging professor, and his students took to him immediately, absorbing as much of the scientific forestry theories as they could. In 1909, Schenck left his job as forester of the Vanderbilt estate. At this time he was forced to close the doors of the original Biltmore School of Forestry. Continuing beyond the schoolhouse on the Biltmore Campus Trail, you will actually pass through a tunnel beneath Hwy 276. On the other side is the Ranger House, built in 1882 for George Vanderbilt’s rangers. Forestry students were also boarded here in upstairs rooms. On the day I visited there was lots of entertainment occurring, with period reenactment and mountain music on dulcimer and harmonica. 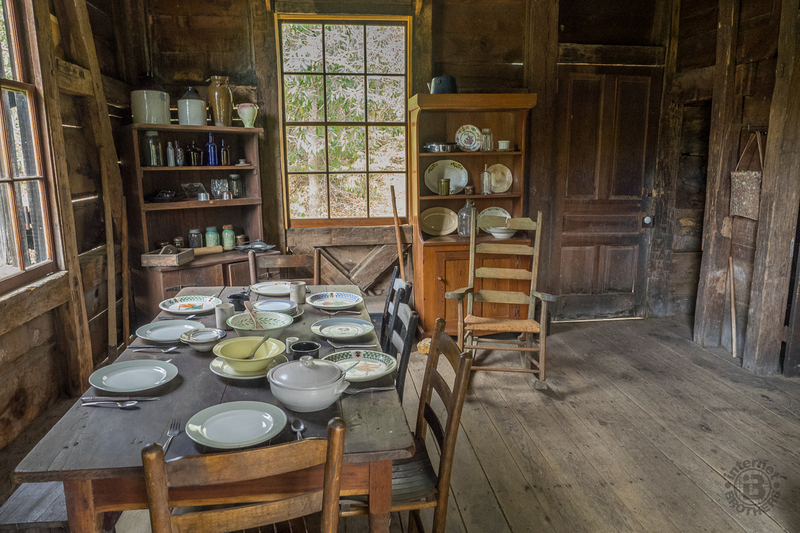 You can walk through the house and tool shed, viewing rooms completely furnished with antiques and artifacts. Next along the trail is Dr. Schenck’s office. Here he graded papers, prepared lectures for the next day, and planned timber projects. His ever faithful dachshund Minnie was always resting comfortably at his feet. Dr. Schenck had a series of lodges built imitating the architecture used in the Black Forest of Germany. Rock House Creek Lodge was constructed of chestnut beams and tulip poplar siding. The photo at the top of this post is Rock House Creek Lodge. There were a total of 14 lodges built in what is now Pisgah National Forest by Dr. Schenck. By the late 1970s, only two remained. The Rock House Creek Lodge was towed by truck to its present home on the Cradle of Forestry campus, while the Cantrell Creek lodge was airlifted by helicopter to a spot adjacent to the Forest Discovery Center. 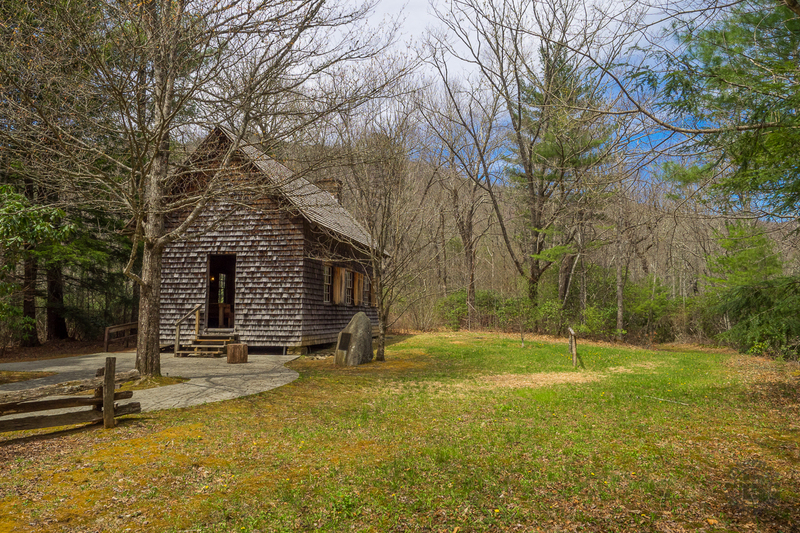 The estate of Verne Rhoades, one of Dr. Schenck’s first forestry students and the first superintendent of Pisgah National Forest, provided the funds for the relocation. This photo is the dining room in Rock House Creek Lodge. The clang of hammer on iron and the acrid smell of coal smoke were common at the Biltmore Forest School at the turn of the century. Travel was by horseback, including back and forth to the schoolhouse, so the horses had to be shod. The iron-working skills were also in high demand to keep wagons on the road and logging equipment in working order. Dr. Schenck told new students to his forestry school to find a place to stay. Many did so by finding shelter in the cabins left by settlers when George Vanderbilt purchased the land that is now the national forest. The students gave their cabins unusual names like Gnat Hollow, Rest for the Wicked, and Hell Hole. There was not a lot of sleeping while attending forestry school. With common sense, composting and fertilization, farmers were able to grow squash, cabbage, onion, potatoes, corn and beans enough to feed their families and the student boarders. One of the favorite events on opening day each year at the Cradle of Forestry is the arrival of the plow horses. You may even get your chance to walk behind and till the soil to plant the new crops. I paused here to break bread with the farmer and learned that he is from Canton, and has been bringing his horses here for the annual demonstration for almost ten years. To finish, you go back by Ranger House, back beneath the highway through the tunnel, past the schoolhouse, and on to the Forest Discovery Center. While there were a few wildflowers blooming this second week of April, if you come to the Cradle of Forestry in late April-early May, the forest and trails are alive with dogwood and dozens of wildflower varieties that are common to Pisgah National Forest. I highly recommend the Cradle of Forestry. For the serious hikers out there, you probably won’t consider this a “real hike,” but it certainly is a delightful stroll through time and place. For families, especially those with school-aged children, the Cradle is chock full of fun, education, and history. There are many men and women of vision who recognized the value of protecting the beautiful wild lands for future generations. We owe a tremendous debt of gratitude to folks like George and Edith Vanderbilt, Gifford Pinchot, Dr. Carl Schenck, Verne Rhoades and a host of others. Their foresight enables us to thoroughly enjoy all that Pisgah National Forest has to offer.